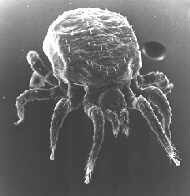 A mite photographed in very high magnification, using a scanning electron microscope. In Linnaeus’ time there were still many things unknown for the scientists to discover. Many organisms known to us today are therefore missing in Linnaeus’ Systema Naturae. Today we can see what was unknown to Linnaeus. He also wrote his thesis on malaria but did not know the existence of the malaria parasite. He described many lichens but did not know that they are composed by two very different organisms, fungi and algae. When diseases like the plague infected whole villages people did not know the mechanisms behind the disease, but tried all possible explanations from bad food to God's wrath. It was not until a good microscope was constructed in the mid 1800's that the scientists discovered bacteria and other microscopically small organisms that could make people ill.
A characteristic of Linnaeus was that he all the time tried to make as logical a conclusion as possible from the knowledge he had, but when the fundamental information was missing it was not easy to reach the right solution to the problems. We sometimes smile at Linnaeus’ conclusions but we have to consider that we have 250 years' experience and new techniques behind us. Today we can magnify small organisms thousands of times and even study their DNA. We have much greater knowledge of the living organisms than Linnaeus had, but who knows, in 250 years' time maybe the people smile at us and find that we were quite primitive.